Basil Hayden’s has partnered with artisans in 6 different cities across the U.S. They have created a limited edition collection – Basil Hayden’s Sipping Companions. 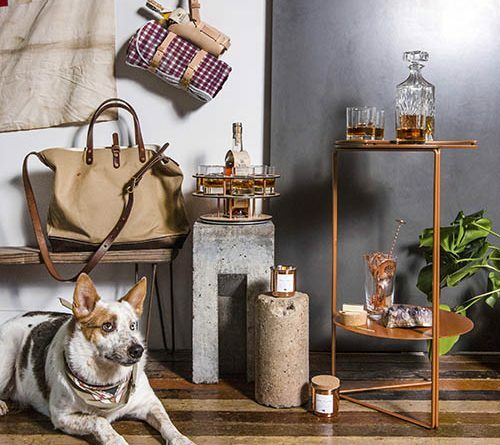 These items will enhance the sipping experience and encourage people to share a glass of bourbon with both family and friends. Basil Hayden’s Sipping Companions make a perfect gift for the 2016 holiday season. Christmas is getting close so consider this luxury spirit offering for that fine bourbon connoisseur in your life. Basil Hayden’s Bourbon is a super-premium bourbon that’s loved by bourbon lovers around the world. Basil Hayden’s Sipping Companions was artfully crafted by a distinct partner who shares the same passion for and dedication to quality and craftsmanship that Basil Hayden’s prides itself in. This luxury bourbon offering promises a truly one of a kind experience for those bourbon lovers lucky enough to be gifted a Sipping Companion this season. Equally at home when tucked into a tidy corner or displayed for all to see, The After Five Bar Cart provides the perfect perch for an evening’s entertaining wares. With space for glassware and a bottle of Basil Hayden’s Bourbon to be stored below, the top shelf separates to create a handy tray for serving whiskey drinks to your guests. Designed and produced by Chicago’s Greta De Parry. Bringing new meaning to pouring a round, The Whiskey Wheel features a revolving tray of six rocks glasses encircling a fitting home for a bottle of Basil Hayden’s Bourbon. A beautiful display that affords a theatric serve it harkens back to a golden era of home entertainment. Produced by the skilled hands at Reclamation Etchworks in San Francisco. The Sidekick Blanket & Holster neatly packs two essentials for an afternoon or evening outdoors. The blanket is made using hand-chosen fabrics and a century-old stitch style, and cleverly rolls into a set of leather carrying straps. There’s even space for a bottle of Basil Hayden’s Bourbon to hitch a ride in its purpose-built holster. Created by the talented sewers and leatherworkers at Los Angeles’ Railcar Fine Goods. The Generous Traveler is a canvas and leather weekender bag designed to hold all the components of a great weekend getaway with friends: clothes, personal items and of course, Basil Hayden’s Bourbon. Thoughtfully designed and assembled by Stanley & Sons Apron & Bag Co. of New York City. A pleasing accompaniment to a relaxing evening of bourbon sipping. The Barman’s Candle Set fills the room with scents that echo the nose and profile of Basil Hayden’s Bourbon. A simple way to deepen the appreciation while sipping. Hand poured in Austin by Slow North into copper tins. Protecting your coffee table is just the start. These coasters set the tone for an evening of sharing bourbon with good friends. Eight wooden coasters are letterpressed with expressions inspired by the generous, hospitable spirit of Basil Hayden’s Bourbon. Hand-crafted by Paper Plates Press in Denver, Colorado. The Life of Luxury enjoys sharing great spirit gift ideas like the Basil Hayden’s Sipping Companions Collection. Return again soon and follow our luxury blog and read about new product launches.